Sesame oil, also known as gingelly or til oil, is obtained from sesame seeds. It plays a prominent role in Asian cuisine and also alternative medicine. Oil is expressed from sesame seeds either by simply crushing or toasting over heat. The first method provides cold-pressed sesame oil. While cold-pressed sesame oil is pale yellow, hot-processed sesame oils have darker shades and markedly different flavor. 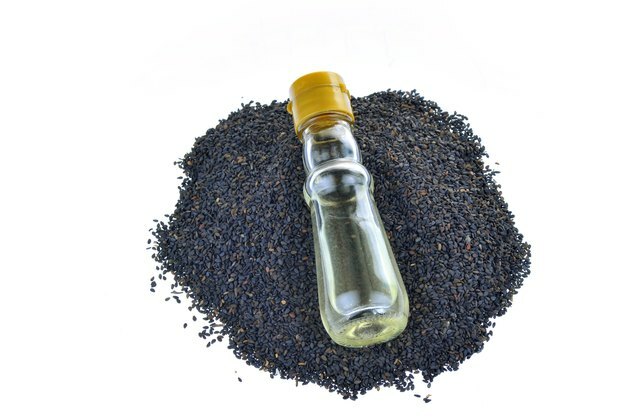 Apart from the mild, nutty flavor of cold-pressed sesame oil, it contains a higher proportion of fatty acids than sesame oil obtained from heated seeds. In addition, the sesamolin content of cold-pressed sesame oil protects it from oxidation and, therefore, increases its shelf-life. Cold-pressed sesame oil is a good source of vitamin E, containing 11.8 mg of the vitamin for every 100 g of the oil. Vitamin E gives sesame oil its antioxidant property. It also has a high concentration of fatty acids, including polyunsaturated omega-6 fatty acids and monounsaturated omega-9 fatty acids. Other constituents of cold-pressed sesame oil include zinc, copper, magnesium, calcium and iron as well as vitamin B-6. Zinc contributes to healthy bones; copper is good for the management of rheumatoid arthritis; calcium is essential for the prevention of osteoporosis, migraine and colon cancer; and magnesium contributes to respiratory health. Cold-pressed sesame oil is known in Ayurvedic practice as the healing oil. When applied topically to the skin or hair, its antibacterial, antiviral and anti-inflammatory properties provide protective, nourishing and detoxifying effects on stressed and damaged skin. The high concentration of omega-6 fatty acids in cold-pressed sesame oil makes it a moisturizing and an ideal massage oil. Sesame oil also rejuvenates the skin and prevents premature aging. It is especially useful for dry and damaged skins as well as in the treatment of sunburn, skin allergies, chemical burns, eczema, rosacea, dry hair and dandruff. It also provides a benefit for patients undergoing chemotherapy and those sensitive to swimming pool chlorine.